You have learned some basics about New Testament Greek either out of desire or compulsion (a degree requirement). Now what? How does the Greek student apply that knowledge to his lesson/sermon? 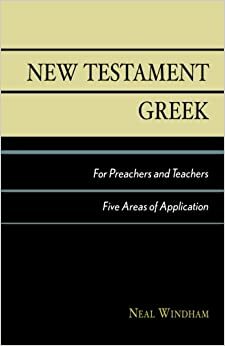 Neal Windham’s New Testament Greek for Preachers and Teachers provides us with, dare I say, an indispensable tool for accomplishing this task. Windham writes under the conviction that a knowledge of Greek is at the heart of ministerial training. In churches that tenaciously hold to the inspiration, inerrancy, and authority of the biblical texts, it is often the case that the ministers, elders, and teachers have limited to no knowledge of biblical Greek. This should not be. All individuals who regularly function in a teaching role should know biblical Greek. While this may seem unreasonable and not an easy task to accomplish, Windham claims that we are not called to mediocrity. We are to be faithful teachers and expositors of the revelation God has entrusted to his church. Windham warns that we must be careful at this point. Knowing Greek does not guarantee that we will know God any better, or that our hermeneutics our any good. Furthermore, it will not give us all the “right” answers de facto. Finally, it should not make us arrogant. Instead, knowing Greek allows us to deepen our appreciation for the Word of God, causes us to be humble, disciplines us, and allows us to prepare messages instead of what was pre-packaged for us from someone else. Who can use the book? Windham has written for students who have completed one year of Greek. This means that he expects that you have completed Greek grammar. He also assumes that his readers have taken a class or have familiarity with hermeneutics. What method does he use? The book covers five practical areas of application: textual criticism, morphology, word study, syntax, discourse. Windham does not intend to provide a comprehensive picture of the exegetical method. His goal is to provide his readers with the most fruitful avenues of study and application in the context of the teaching/preaching ministry. Each of the book’s chapters contain the following contents: introduction to the tools, procedures, textual examples, application of findings, practical suggestions, conclusion, practice problems, and a select bibliography. Chapters two and three address the discipline of textual criticism. It may be tempting for many to ignore textual criticism entirely due to its inherent complexities. Doing so, however, would be like a builder beginning his construction of a home without the right materials. He might complete the project, but the house will look nothing like the one described in the blueprints. 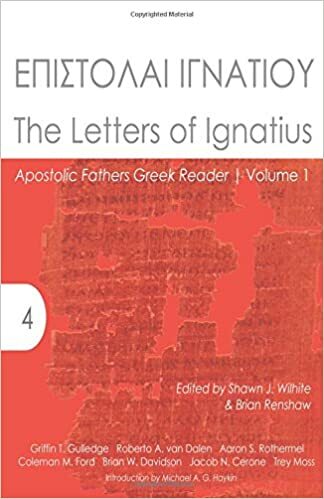 Chapter two describes the tools for the task (UBS3 and NA26), the manuscripts of the New Testament and their value (papyri, uncials, minuscules, lectionaries, versions, and church fathers), the kinds of errors (faulty word division in later manuscripts, haplography, dittography, and letter confusion), and a brief history of texts and their respective families. Chapter three proceeds to the process by which the textual critic selects the right reading on the basis of external evidence (date, quality of manuscript, geographical distribution, and genealogical relationship) and internal evidence (shortest reading, more difficult reading, and the style/context of the writer/discourse). Windham urges preachers and teachers to share their findings in the sermon/lesson. Not doing so will leave the audience frustrated at the presence of marginal readings without explanation. At the same time, the preacher must be sure to keep it simple, short, interesting, and relevant. One of the most helpful elements of this chapter is a three-page example of how to present a text critical issue and one’s findings (56-68). We now turn to the topic of morphology in chapter four. Windham’s discussion of prefixes and suffixes is of utmost value to the student. Here the formation of a word is discussed, how to discover the root word, how to avoid the etymological fallacy, and how to spot different types of nouns based upon their endings (process, result, class, person, agency, quality, abstraction, and concrete). Chapter five moves into a discussion of word studies conducted within context. This section alone is worth the cost of the book. Never before have I seen such a detailed approach to word studies. Windham begins by explaining why we must do word studies. Words have multiple meanings, their meaning changes over time, there is semantic overlap with other words, and some words are used infrequently and need extra attention for correct understanding. Next, Windham tells us how to choose words for study. He suggests that we read the passage in English several times, read the passage in the Greek New Testament, pick words with a theological orientation, repeated words, and words that have similar but different meanings with other words in the context. How does one start studying the words she selects? First, we need the proper tools. We need a concordance (Moulton, Wigram, or the Computer Konkordanz), a lexicon (BDAG and Louw and Nida), and a theological wordbook (little Kittel, and NIDNTT). Now we are ready to proceed. Windham advises we study words according to the following six steps: 1) consult BDAG for basic definitions, 2) look the word up in a concordance and study the various contexts in which the word appears noting the various contextual associations in each instance (see summary on 116-117 for a detailed discussion on how many passages should be studied), 3) reread in detail the entry in BDAG checking to see if your findings are consonant with the lexicon, 4) check Louw and Nida to in order to see if the semantic domain discussion adds anything to your findings, 5) consult the theological dictionary for any additional contextual associations and compare your findings with those in the article, 6) synthesize all your findings and select an appropriate definition without falling prey to the etymological fallacy, overloading meaning, or using the same meaning in all contexts. Since the process can be overwhelming, Windham has provided students with a demonstration of the word study process with three examples. At the conclusion of this section, he advices pastors to allow the word study to help write the sermon. Word studies are content heavy and are able to add much needed depth and nutrition to the sermon. Recognizing that he is not providing a comprehensive guide to syntax, Windham highlights the indicative verb, nouns, and participles for discussion in his seventh chapter. Under each of these categories is provided a brief survey of the syntactical options available to translators and interpreters. These options allow us to better understand how an author has used the genitive case, the present tense verb, or an adverbial participle. Windham warns the student that with so many options available, it is tempting to force an interpretation to agree with our pet theological conviction. Don’t do that. Included within this chapter is a brief tutorial on how to create a diagram of a passage according to its independent and dependent clauses. This diagram can serve as the bases for a sermon outline. The final chapter is a brief overview of discourse. Many introductory discussions of discourse and discourse analysis try to do too much. Windham’s goal is to simply make us aware of the existence of certain markers. Authors use various constructions in order to indicate the structure of his communication. John repeats the phrase “I want you to know, brothers.” Other authors have their own unique ticks, so to speak. Interpreters should look of repeated phrases or words, markers that indicate the structure of a passage, and shifts in the subjects. These various elements will help distinguish units of thought. Windham’s book is a gold mine. If you are a preacher or a teacher struggling to put your Greek to work in the ministry, this is the book for you. Technical words are discussed in context, so there is no need of a glossary. Windham instructs students in what tools are available and how to use them. He provides countless examples to illustrate concepts. He walks us through the process step-by-step. If that isn’t enough, he shows us how to apply the data in a sermon by writing out portions of a sermon. He constantly warns preachers that while it is important that he know the technical information, it is his responsibility to distill it in an understandable and relevant manner. And yes, he gives examples for how to do that as well. There are a few minor drawbacks. First, the book is dated. The UBS3, NA26, BAGD, etc. are no long being used. This wouldn’t be too much of a problem, but his discussions are based upon these texts down to the page numbers. Second, the book’s formatting is not conducive to learning. There are no illustrations (compare with Erickson’s page excepts from the UBS3, NA26, BDAG, Louw and Nida, etc). The tables that Windham provides are barely distinguishable from the text. The result is that the book looks like one huge wall of text. It is content over-laden, you might say. Finally, I would have liked to see a bit more attention given to narrative texts in the New Testament. Windham recognizes that his syntactical diagramming does not work as well for narrative passages. What does? In essence, these four criticisms amount to a cry for a new edition! If you couldn’t tell by the length of the review, I loved the book. The introduction was a strong and much needed exhortation to continue using Greek in ministry. Everything he included was tailored to his aim of providing an accessible and useful tool for teachers. On a personal level, I plan on using this book in my own teaching. When it gets time to teach my Greek students how to do a word study, what better way than apply Windham’s method and use the tailor made examples he has already given? This is, hands down, one of the best tools for bridging the gap between exegesis and exposition, raw data and relevance. This entry was posted in Book Reviews, Exegesis, Greek, Greek Resources, Teaching and tagged Exegesis, Greek, Ministry, Preaching. Bookmark the permalink. Excellent review of an excellent tool.